Since December 2015 the Federal Reserve has made nine increases of 25 bps each to the Fed Funds rate, which now stands at a level of 2.25-2.50%. Last quarter we wrote that the Fed projected only two rate increases for 2019 and we questioned if they would follow through. It now appears they will not, as in their January meeting, the Fed dropped any references to future rate increases while also committing to holding rates steady. Furthermore, in their March meeting they explicitly stated they don’t expect to have any rate increases during 2019 (unless there were significant changes to the data). Listen to Mario Nardone of East Bay Financial Services discuss markets and the economy in the first quarter of 2019. The U.S. central bank is not alone, however, in their dilemma on what to do with rates. The European Central Bank (ECB) ended its bond buying program last December and stated in March it would hold interest rates at their current levels at least through the end of 2019. Concerns about an economic slowdown ripple across Eurozone countries including Germany (weakening exports), France (demonstrations slowing President Macron’s planned economic reforms), UK (Brexit), and Italy (budget woes). While U.S. central bank rates are still low compared to historical norms, they are still above those of the ECB, which will have fewer options if the Eurozone is indeed headed towards a more severe slowdown.With inflation continuing to run below their 2% target, the Fed and Chairman Powell are currently in a wait and see mode, monitoring the impacts of recent rate increases, the slowing global economy and continued trade tensions. In the end, they determined that it was better to keep rates steady versus the potential risks of another rate increase. Expect the Fed to continue their flexible, easy monetary policy as they continue to monitor inflation and employment measures. Speaking of Brexit, there is still a lot to be decided regarding the UK’s exit from the European Union (EU), including the simple question as to whether they will leave the EU or not. In fact, March 29 was the day scheduled for the UK to leave the EU. However, this hasn’t happened. UK Prime Minister, Theresa May, offered to quit her post if her plan to leave the EU was accepted. Interestingly, while it was still rejected, there was also no agreement on any alternative, though there is agreement that leaving the EU without a plan is not a good option. Unfortunately, if things stay as they are today, this is exactly what will happen on April 12 (we may know more by the time you are reading this). Be on the lookout for a longer-term solution. Separately, what can be said is that there have been long term implications for the UK that stem from the Brexit conversations over the last few years. Outside of the political turmoil, there are other real-world implications. Specifically, businesses have needed to create plans for multiple scenarios, leaving companies with high costs and lots of uncertainty. In all of this, London has lost its status as the top-ranking global financial center, falling behind New York City. While a move from #1 to #2 may not seem like a lot, the question is whether the fall will continue and what other impacts there will be among other industries and businesses. From a financial center perspective, cities like Frankfurt, Paris and Dublin have benefited from the disorder Brexit has brought. John Bogle, founder of Vanguard and icon in the investment industry, passed away in January 2019. Mr. Bogle is often described as the father of index funds and was a major advocate for the average investor, focusing on lowering fees and long-term investing. While passive investing is commonplace today, it is hard to imagine the skepticism he faced in launching an index fund in 1975, when traditional active management completely ruled the day. Mr. Bogle had a significant impact not only at Vanguard, but across the industry and to millions of investors that have followed his views. Separately, in February, Bill Gross announced his retirement from Janus Henderson. While Mr. Bogle was a staunch believer in indexing, Mr. Gross, known as the “Bond King,” was the epitome of the star active manager, writing countless articles, opinion pieces, and appearing regularly on television. His prowess as a bond manager helped bring PIMCO, where he worked for decades, to new heights while at the same time transforming how people invested in fixed income. In fact, the PIMCO Total Return fund, the fund he is most famous for managing, once reached almost $300B in AUM. While both individuals had different approaches to investing, both were industry titans who in their own way, worked hard to put the interests of their clients first. In highlighting these two industry leaders, we thought it would be interesting to see just how much the investment landscape has changed in the last decade or so from two standpoints, in the context of: 1) fees and 2) flows into active vs. passive investments. For definitional purposes, active management has the goal of outperforming a specific market or benchmark while passive management looks to mimic a specific market or benchmark. From a fee perspective, fees of both active and passive equity mutual funds have dropped significantly since 2000. Over the last several years, we have seen the “race to zero” in full force as index fund providers continue to lower their fees. In order to compete in this environment, active managers have been forced to lower their fees as well. Regardless, whether you invest actively or passively, the lowering of fees is great for all investors. Investors have been letting their money do the talking. Assets in passive equity mutual funds have skyrocketed while assets in actively managed equity mutual funds have flattened out over the last five years. Turning our attention to market performance, the U.S. saw a sharp, positive reversal in returns from Q4 2018 to start 2019. While December 2018 saw its worst monthly return for the S&P since 2008, January 2019 experienced its best start to the year in decades. Remember, what occurred in December 2018 could be attributed to the Fed’s rate increases, concerns about a slowing global economy and continued tariff talk with China. While we still see concerns about a slowing global economy and there are still ongoing trade discussions with China, the previous comments noted about the Fed’s willingness to be flexible in their strategies and maintain easy monetary policy has been a likely reason for the uptick in US equity markets so far this year. 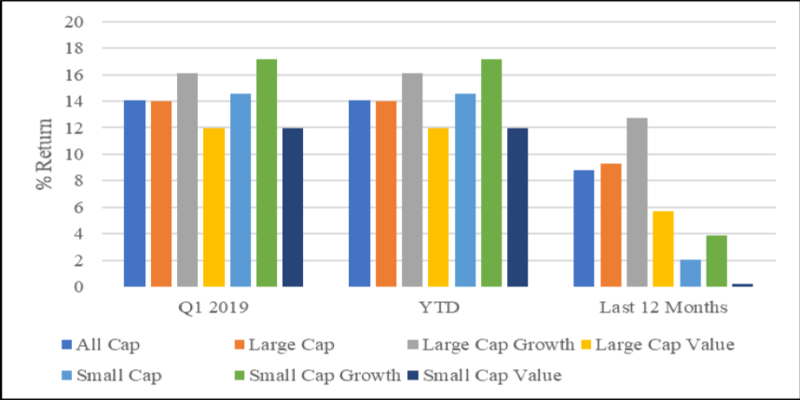 Continue to keep an eye out on small caps as their revenue is more closely tied to what happens domestically whereas large caps are more multinational in nature. Similarly, the fact that interest rates are not likely to rise significantly more at this point can also be a positive for small cap stocks as higher rates can negatively hurt their borrowing costs more so than for large companies. Growth is slowing but not stalling. Both Europe and Japan entered contractionary territory for the first time in several years (2013 and 2016 respectively). Even with the unknowns regarding Brexit, protests in France, Germany’s slowing growth and overall trade tensions (see: China), international equity markets had a solid quarter. International equities remain undervalued relative to both historical norms and current US valuations. Similarly, while the dollar has been strengthening overall for the past 5+ years (which negatively impacts the return of international equities) the dollar didn’t move much over the Q1 2019. Our recommended portfolios generally have a sizable allocation to non-US equities, both developed and developing, and would therefore benefit from a recognition by investors of the attractive valuations and/or a reversal in the dollar’s rise. Global REITs, as represented by the Dow Jones Global Select REIT, jumped 14.3% for the quarter, with a slightly higher one-year return of 14.7%. The U.S. portion gained more than their non-US peers during the quarter (15.7% vs. 11.7%) and had the advantage over the last 12 months (19.7% vs. 5.5%). As a reminder, REITs can display a sensitivity to rising yields. However, even with that sensitivity, we believe in the importance of a REIT allocation and the possible diversification benefits of global REITS over time. The yield curve inverted! The yield curve inverted! You are likely to hear this exclamation in the coming days, weeks and maybe even months. This phrase is often followed by “the next recession is coming”, which for good measure, is because an inversion of the yield curve often portends a coming recession. However, there are several issues with this statement. Before we get into those details, let’s define the terms yield curve and yield curve inversion. The yield curve is a graph showing the yields of fixed-interest rate securities against their time to maturity. In a normal yield curve environment, longer-term rates are higher than short-term rates as investors are compensated for the risk of investing their money over longer periods. When the yield curve inverts, shorter-term rates are above longer-term rates. One problem becomes defining what is meant by short-term and long-term. While the 10-Year US Treasury is often seen as the benchmark for long-term, there is disagreement as to whether the short-term is defined by the 3-month T-bill or the 2-Year Treasury. Why does this matter? Because, depending on which one you look at, the yield curve either inverted or didn’t invert. There was inversion between the 10-Year Treasury and 3-Month T-bill (for just a few days near the end of the quarter) but not between the 10-Year and 2-Year Treasury. Why is the yield curve inverting? Let’s remember that the Fed sets the short-term rates while the market and inflation expectations set longer-term rates. On the short-end we have had the Fed raising rates steadily over the last few years, until their pause this past quarter. Similarly, on the long-end, low inflation expectations, the belief that central banks are more willing to hold rates steady for a longer period of time, and concerns about slowing global growth have been driving down longer-term rates. Long-term yields have dropped in 2019 vs. shorter-term rates that have remained steady. Is it better outside the US? Actually, no, it could be argued that it’s worse in pockets outside the US where 10-year Government bond yields in countries like Japan and Germany are negative while others like the UK, Canada and Australia have yields still below those in the US. When is the next recession going to be? Obviously, we don’t have a crystal ball to tell if this inversion is a false-positive or a sign of coming trouble. What we do know is when recessions have followed inversions, the lag between the first inversion and the recession has ranged from anywhere from just a few months to a few years. We also know that we are, most likely, in the late stages of an extraordinarily long bull market, and if you study economic history, it is only a matter of time until this cycle comes to an end. As a reminder from some of our comments from last quarter, inverted yield curves are correlated with recessions, they don’t cause them! Our recommended portfolios generally eschew long-dated bonds in favor of the better risk-adjusted-yield profile of shorter-term alternatives, including corporate bonds which have historically performed more favorably vs. Treasuries, and did so in the 1st quarter. Our focus will continue to be on high quality bonds with an emphasis on short to intermediate duration Treasury and corporate bonds, where default risk is relatively low. For some investors, muni bonds are attractive for their tax-free income, and have positive fundamentals as states and local governments benefit from the improving domestic economy. This document contains general information, may be based on authorities that are subject to change, and is not a substitute for professional advice or services. This document does not constitute tax, consulting, business, financial, investment, legal or other professional advice, and you should consult a qualified professional advisor before taking any action based on the information herein. This document is intended for the exclusive use of clients or prospective clients of East Bay Financial Services, LLC. Content is privileged and confidential. Information has been obtained by a variety of sources believed to be reliable though not independently verified. Any forecasts represent media expectations; actual returns, volatilities and correlations will differ from forecasts. Historical and forecasted information does not include advisory fees, transaction fees, custody fees, taxes or any other expenses associated with investable products. Actual expenses will detract from performance. Past performance does not indicate future performance. The sole purpose of this document is to inform, and it is not intended to be an offer or solicitation to purchase or sell any security, or investment or service. Investments mentioned in this document may not be suitable for investors. Before making any investment, each investor should carefully consider the risks associated with the investment and make a determination based on the investor’s own particular circumstances, that the investment is consistent with the investor’s investment objectives. Information in this document was prepared by East Bay Financial Services, LLC and although information in this document has been obtained from sources believed to be reliable, East Bay Financial Services, LLC does not guarantee its accuracy, completeness or reliability and are not responsible or liable for any direct, indirect or consequential losses from its use. Any such information may be incomplete or condensed and is subject to change without notice.